Montserrat means “Teeth Mountains”, and it is not hard to guess why they are called that. These mountains were formed due to the sea water polishing in prehistoric times. Home to the Monastery, Montserrat is of religious and historical significance. Montserrat was destroyed in 1811 when the French invaded Catalunya. In 1844 the Monastery was rebuilt. The Monastery is set in a picturesque location, at the very heart of Montserrat mountain. The geology, flora and fauna that forms part of this landscape make hiking up the mountain very fulfilling. 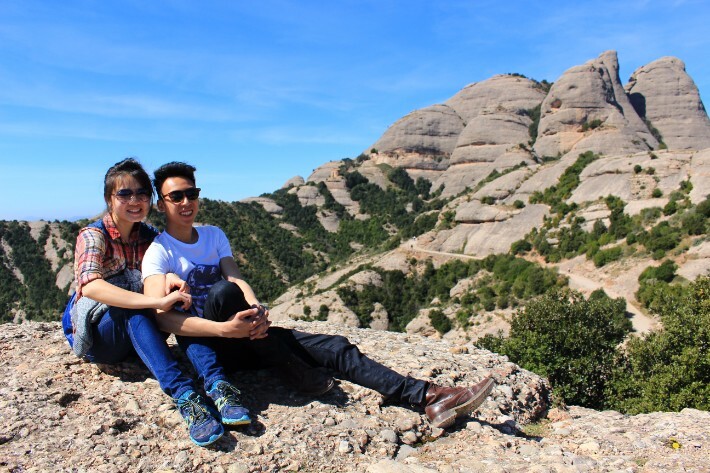 It was certainly an unplanned trip when we decided to take a day trip out of Barcelona to visit Montserrat. Find accommodation in Barcelona on Hostelworld, Agoda or Booking.com. Montserrat’s weather can be classified into 2 periods – a wet, warm period from June to January, and a dry, cool period from February to May. Temperatures range from 13 – 14 degree Celsius on average. Keep in mind that Montserrat is at the top of a mountain, so compared to ground temperature, it can either be colder, windier or warmer. If you are up for hiking up Montserrat like us, be prepared to be exposed to the Spain weather, as there is not much shade en route. Do dress adequately – slap on sunscreen or cover up! Make your way to Plaza Espanya train station in Barcelona. The train station is in the same building as the metro station. Once at Espanya, look for Line R5 headed towards Manresa. Train duration from Barcelona Espanya station to Montserrat is 1 hour. The cable car ride from the train stop Aeri de Montserrat is only a 5 minute ride. You will have breathtaking views on the cable car ride up to the monastery however you would have to stand throughout the journey. This rack railway service that will take you from the bottom of Montserrat Mountain to arrive at the Montserrat Monastery. If you opt for this option, get off one stop after Aeri de Montserrat called Monistrol. The Rack Train ride will take 15 minutes to the Monastery and is a more comfortable ride than the cable car offers however you wont have as good views as you would from the cable car. You can, though, sit down throughout your journey and is thus suitable for the wheelchair-bound. a. Return train fare from Barcelona to Montserrat, either with the Cable car ride option to the monastery, or if you prefer the Track Train mountain train ride – but remember you need to specify which when you buy this ticket because they are not interchangeable. You either buy a Cable Car version or you buy the Cremallera version (funicular from Barcelona to the monastery) of this ticket. b. 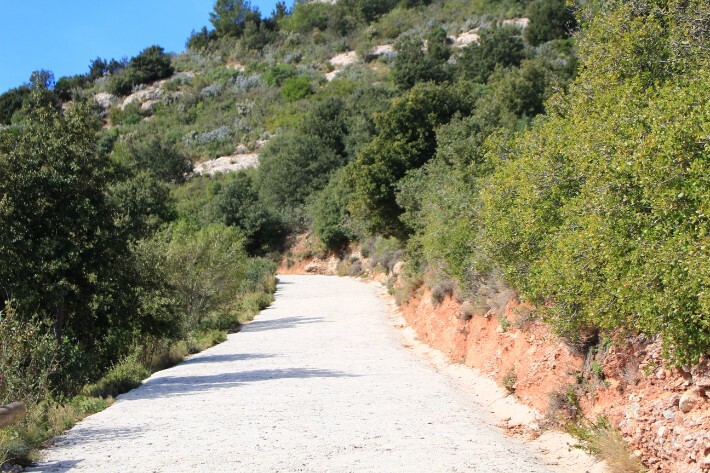 2 return journeys on 2 different funicular rides – Funicular de Santa Cova & Funicular de Sant Joan. 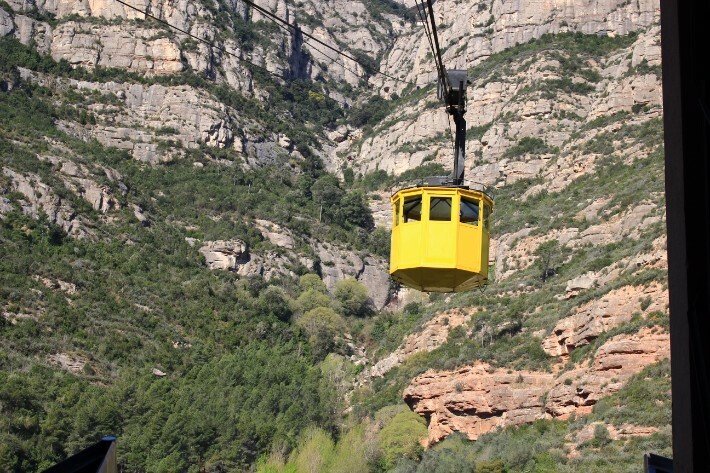 You catch these funicular rides once you arrive at the monastery, which brings you to different parts of the mountain, including the top of Montserrat mountain and the Santa Cova cave. This ticket saves you from €10.30 (return)/ €6.50 ( single) for the funicular from the Monastery to the top of Montserrat mountain and/or another €4.00 (return)/ €2.60 (single) for the funicular ride from the Monastery to Santa Cova Cave. c. 2 free metro rides with this ticket. Each metro ticket costs €2.15 each. d. Access to the audio visual area on Montserrat. b. Lunch at the restaurant at Montserrat. The restaurant offers a buffet lunch. We found the most value in the Trans Montserrat Ticket option at €29.30. First thing to do when you arrive? Grab a Monserrat map from the tourism office to get your bearings! There are a few options to go about while you’re at Montserrat. 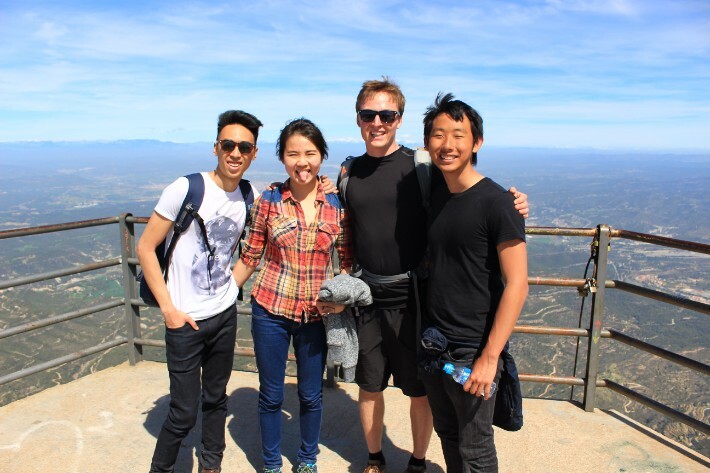 Instead of taking the funicular or cable car, we took off on foot, hiking up the steep slopes of the mountain towards the Sant Jeroni peak, at 1,236m high. Hiking to the peak took us 3-4 hours. En route, we were greeted with sights of the teeth formations. The clear sky accentuated the already picturesque landscapes. 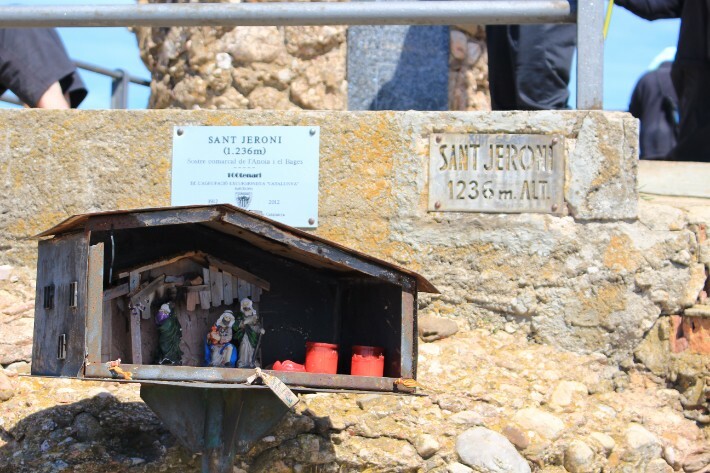 Apart from visiting the monastery, take some time to visit Sant Joan’s peak via the Funicular de Santa Cova. 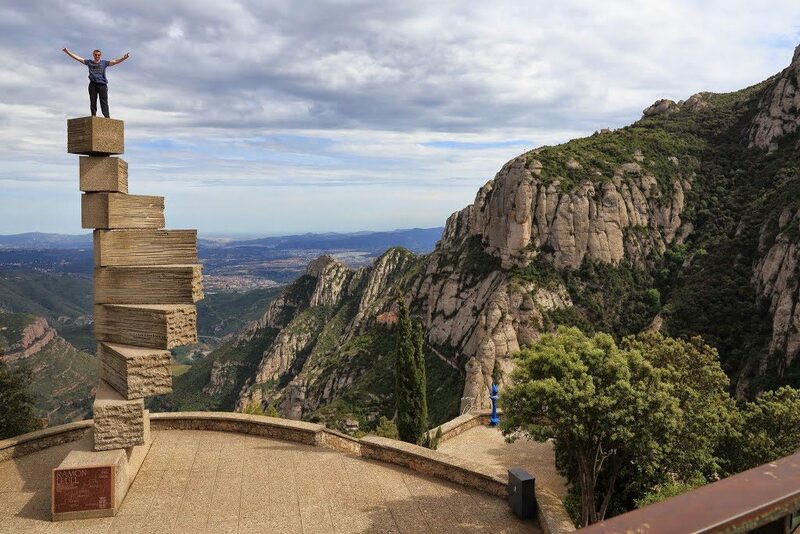 Catch the viewpoint of the entire Montserrat Monastery. The views are impressive. You can return with the funicular again, or can hike down the monastery. It is a scenic but long walk which takes about 3 hours. The Funicular de Santa Cova takes you slightly back down the mountain to the starting point of Montserrat. Here, visit the cave chapel Santa Cova. Legend has it that this is the cave where the image of Mare de Deu de Montserrat (the Virgin Mary) was seen by shepherds. The cave sits about 20 minutes walk from the funicular station or you can choose to walk directly from the Montserrat Monastery to the cave. Don’t miss this viewpoint on the monument Escala de L’Enteniment dedicated to the Catalan philosopher, Ramón Llul too! 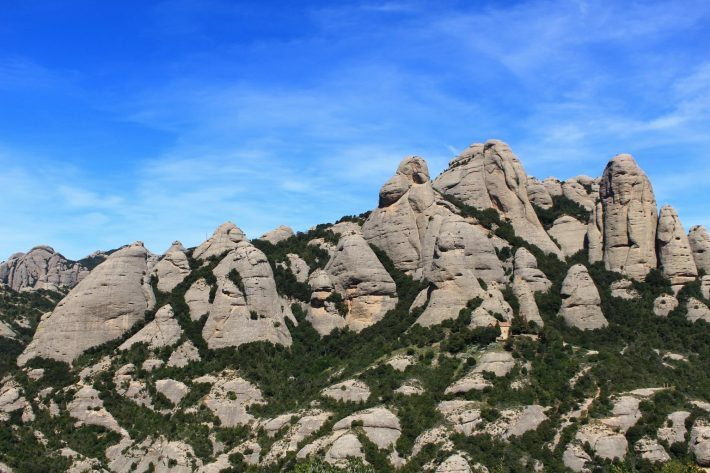 If you want to try out some hiking trails, or even hike to the peak of Sant Jeroni like us, dedicate a full day to exploring Montserrat. You can look for other ideas on day trips out of Barcelona here. What a nice spot to visit! How beautiful!! Definitely adding this to the bucket list! That view point is out of this world. What a beautiful place to hike and visit. HI! I’m trying to plan my visit to Montserrat and this post was a lot of help! I’m still a little confused though. Does the trans Montserrat ticker include the fair from Montserrat to Barcelona(you said Barcelona to Montserrat)? If I get this ticket, I wouldn’t have to pay the €20.20 return fair from Montserrat to Barcelona, correct? On point 3b where you say that two return funicular rides re included, does that mean I have to pay for the rides going up? Thank you!!! Great, thank you for the detailed info! I’m in Barcelona this February, I might take this trip! Never made it up there. Will have to return. Montserrat looks like a wonderful place to head out to from Barcelona. You have provided a wonderful guide which gives different options to get there. But probably what appeals to me is to hike, the way you did. Must have been a thrilling experience. I loved the viewpoint at Escala de L’Enteniment. That aerial tram ride sounds amazing! And the monument to Ramon Liul – wow! – what a stunning piece of art and a great view of the surrounding mountains and valleys! What an awesome day trip from Barcelona, so convenient as well only 1 hour away! Monsterrat looks beautiful from your pictures, so picturesque! Hope we make it there one day! Thanks for the travel tips. This is the first time I have heard of the teeth mountain. My last mountain hike was when I was 14 years old. Thank you for providing us on different ways to go to the Montserrat Spain. Even though it was long, long time ago since I did a hike, I can still vividly remember the feeling being able to reach its peak. It is a wonderful feeling that words are not enough for me to express my appreciation of it. Im so glad I came across this post Im heading to Barcelona later this month and was looking for other things to do. The cable car looks great as do teeth mountains! Nothing like a cool day trip out of the city! Will definitely need to check this out if I’m ever in Barcelona. That cable car looks awesome, bet the views were incredible! Hello Isabel, I am visiting Barcelona next month and after reading your blog, would definitely like to go to Montserrat. My 70 year old mother will be with me. If we took the Furnicular to go to the Monastery and mountain, is there any hiking or trekking required at all or just some walking? She is not on a wheelchair and can walk but cannot climb much. Hi Lakshmi, thanks for checking my post up! I admire your mum – she’s got an adventurous spirit! There are gentle trails when you reach the top from the Funicular. There’s also a tourist site at the top and some shops for you to take a break. Enjoy your trip! My wife and I are excited for the vacation we’ve booked in Europe to Spain and definitely we will go to the Canary. Tenerife is one of our eyeing place for our 1st stop 🙂 There so many thing we want to do from a page we’ve read https://www.canaryislandsinfo.co.uk/tenerife/things-to-do/.I wanted to know if you have experience traveling to this wonderful Island.